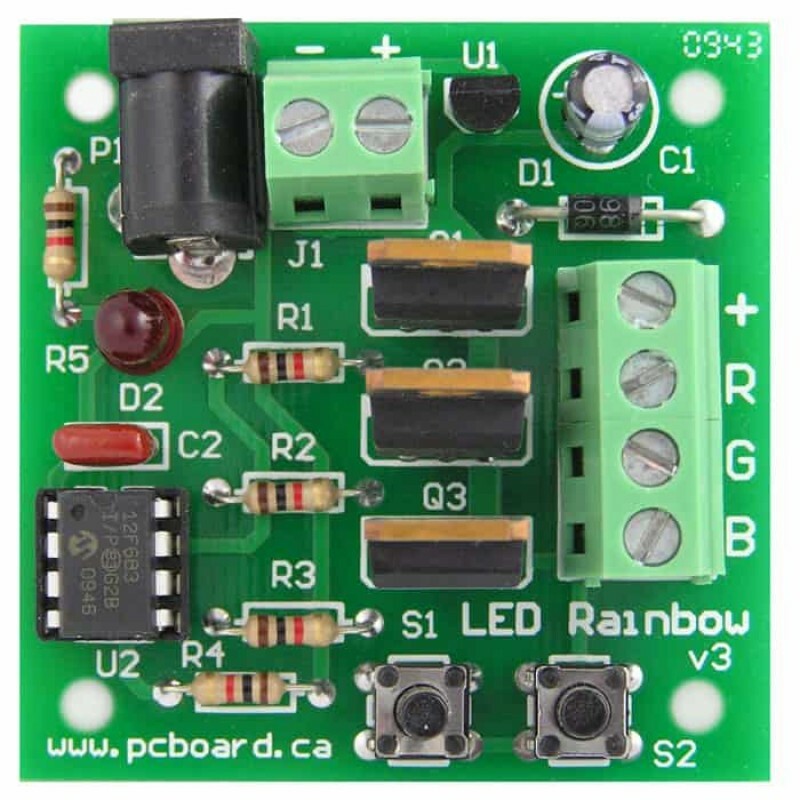 The LED Rainbow is a dedicated Pulse Width Modulation (PWM) controller which generates color changing effects with RGB LED lighting products. 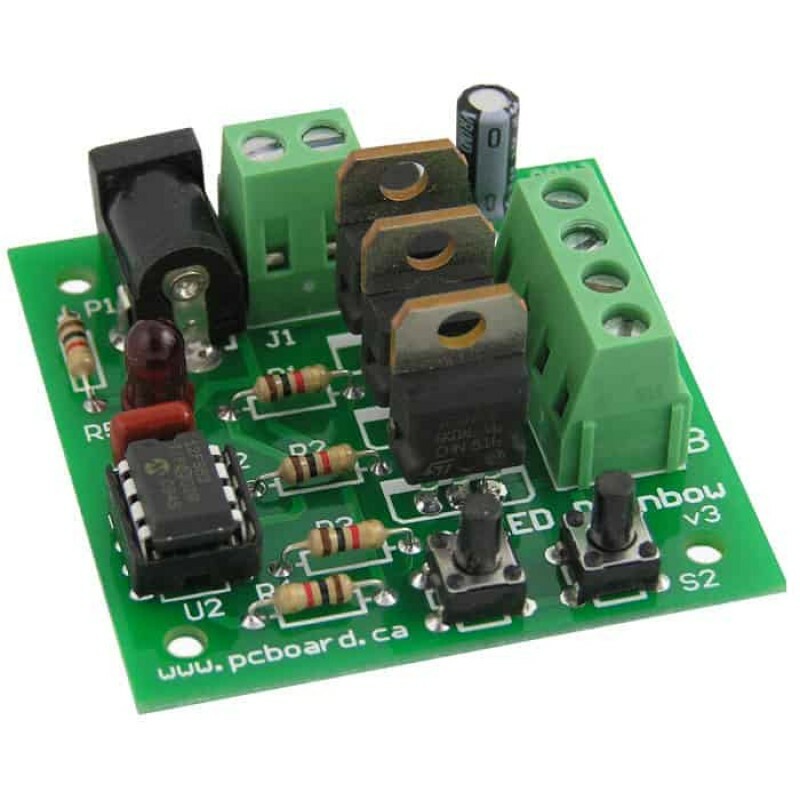 The circuit controls three outputs, each which has the ability to run an LED segment, and with three segments, is a natural for the control of RGB LED arrays. 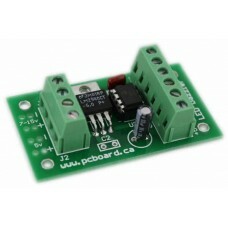 The system was updated in May of 2010 to version 3.0 and now features a power indicator along with professional grade rising clamp terminal blocks allowing for solder-free connections to be made to the board for power inputs and signal outputs. Sequences are fully customizable and are contained in the microcontroller, which has the ability to strobe, cycle and fade the lighting, creating a massive palette of over 16 million colors using Pulse Width Modulation (PWM) technology. Each output has a resolution of 8-bits, which gives each color a range of 256 intensities and when the three colors are mixed together, a full rainbow of color combinations is possible. 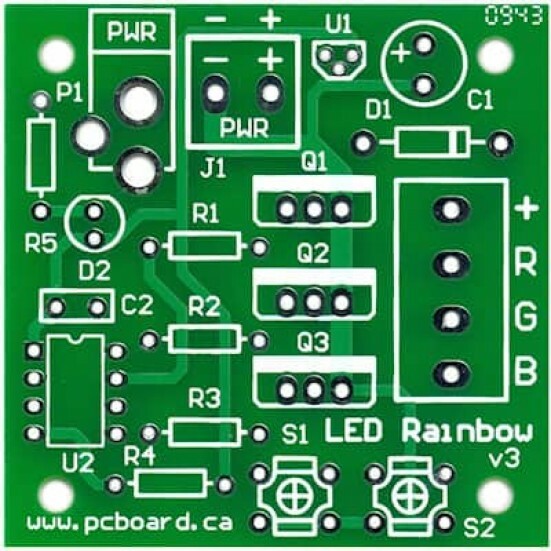 With a minimal parts count, the LED Rainbow is very economical for the hobbyist to build, using industry standard components and running off of a standard 12v-15v power supply. The 2" (51mm) square board is a double sided construction with a detailed silk-screen which aids in the placement of the components. 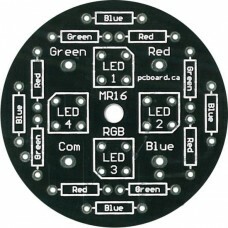 The output of the LED Rainbow can be connected to accessory boards such as our LED TriLight, which holds nine 5mm or Piranha LEDs in a strip, our LED MR16 which holds nine 5mm or Piranha LEDs on a circular board, or our LED MR16RGB which holds four RGB Piranha LEDs in a circular pattern – each available separately. For more information and technical details on the LED Rainbow, please visit our Support Site. 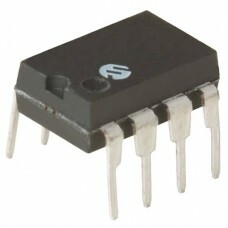 Note: Although the images show an extra pushbutton switch at position S2 and power jack at P1, these are are optional and not needed to operate the system. They are shown only to aid in understanding the full options available on system. 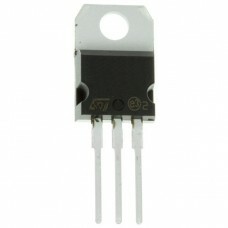 Family: MOSFETs, GaNFETs - Single Series: STripFET FET Type: MOSFET N-Channel, Metal Oxide FET Fe.. 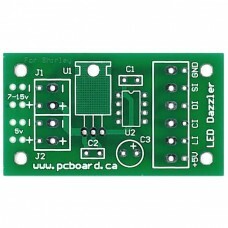 LED Rainbow Kit All Parts Needed To Build The Kit Yourself The LED Rainbow is a dedicated Pulse Wi.. 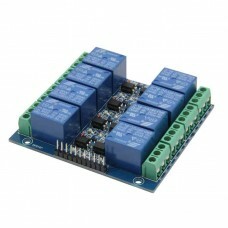 Features: Output Voltage Range: 1.2 - 37v Output current in excess of 1.5A 0.1% line and load reg..
8 Channel Relay Module for Microcontrollers Eight independent optically isolated inputs connect d.. 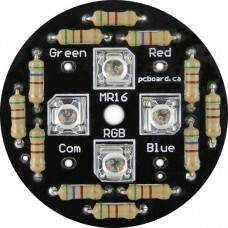 LED Rainbow Assembled and Tested The LED Rainbow is a dedicated Pulse Width Modulation (PWM) c..